Magic 4 Children provide childrens entertainers Liverpool residents can trust, and they are rated the best in the business. They know what their young audiences like, so they put on exciting performances to meet the needs of this special category of individuals. In addition to being funny, hilarious and entertaining, Magic 4 Children are reliable and dependable. These qualities are sure to put a lasting smile on the faces of the children at the parties, as well as parents and of course the booker. Children are fun-loving human beings with naturally-curious minds. This innate ability must be nourished and encouraged because it helps their personal growth and development. Nothing excites party children more than activities that stretch their imagination. Fortunately, Magic 4 Children is a fantastic group of childrens entertainers in Liverpool who understand this important concept and bring life and magic to any event where children need entertaining. Here is a comment from a recent performance at the St Agnes RC Church Hall in West Kirby in Liverpool. Imagine a happy bunch of children attending a birthday party where they arrive expecting the usual. Upon their arrival, they are greeted by an animated, funny and colourful kiddie’s entertainer. Magic 4 Children delight with scores of entertaining activities, including magical tricks, a fun kids disco and interactive games with prises. 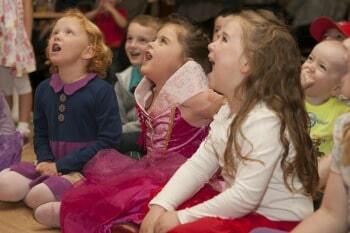 This is a small facet of what to expect from the premier childrens entertainers Liverpool has to offer. They can pull a rabbit out of a hat in a jiffy, while children tumble over with laughter and excitement. This is the perfect occasion to add some extra magic. Wedding receptions are events where grown-ups long to find constructive activities that will keep the younger guests safe and out of trouble. Clean fun is the answer. This is a time for magical antics so bring in the most favoured childrens entertainers in Liverpool to assist and ensure your younger guests have a ball. A good school understands the mandate of a well-balanced curriculum. Like the saying goes, "All work and no play make Jack a dull boy." Without a balanced learning atmosphere, true education could be impeded. To guard against this stigma, schools make special arrangements to sponsor exciting and rejuvenating activities. This concept helps to enhance students' minds and send their imagination soaring. To add to the learning experience, Magic 4 Children is the recommended childrens entertainers Liverpool schools use to entertain their children. Some holidays are especially planned with children in mind. Magic 4 Children are prepared for this, so they also provide seasonal fun. They know that when it comes to the entertainment of the youth, variety is important. Therefore, there is always an array of year-round, colourful magic in the air for their benefit. If you are looking to hold a special Halloween magic show or maybe a festive Christmas party then call in the best childrens entertainers Liverpool has to offer to ensure a successful and special day for all. What better way to add to your child's historical moments than by making his or her christening an event loaded with magic and fun? Since they will not be able to recall anything from this momentous occasion, parents can keep visual records. This is an excellent way to enlighten them about all that transpired at their christening, as they get older. The knowledge that this proven group of childrens entertainers Liverpool residents can count on is accessible is a rewarding comfort. In closing I include one last testimonial taken from kids entertainment done by Magic 4 Children in Mossley Hill in Liverpool. Make-believe is an integral aspect of a child's world. Fortunately, Magic 4 Children understand this making them the best choice of childrens entertainers Liverpool party organisers could wish for. They are an asset to children's curious side. The shows demonstrate passion for engaging youngsters' developing minds. St Michael & All Angels Pensby is a lovely children's party venue in Merseyside, Liverpool with ample parking and a light airy room where the kids can eat and play and a separate area with round tables and chairs where parents can relax while the kids have fun.